How was your Christmas? We had a splendid day, beginning with the delight on the kids faces as they discovered that the reindeer had munched all the carrots they left out, and that Santa had responded to their notes. In the afternoon we treasured some much needed quiet time while Jack read a new book and Caroline carefully colored a do-it-yourself purse. Our day ended with friends and family gathered around for a meal that ended with many pies baked by Grandma Caroline. If life is all about the memories, that was one to store like precious gold. I hope each of you had a memorable day too, in the best of ways. Yesterday was such a beautiful sunny day after the unexpected storm on Christmas–I love to see the rays of sunshine burn off a morning fog when it has been raining for a few days. Today the clouds have descended again, but it’s fancy Friday around here, and the smiles from all of you have kept us hopping all day long. Today I’ve had child labor around the store: two kiddos who want to earn some money after a trip to the “toy store” (aka Foothill Mercantile) yesterday. They are eager to help, and I’ve been scrambling to find chores they are capable of doing around here. So far we’ve had some dusting, some dishwashing, and some re-labeling of the tea bins. There’s nothing better than smiles while you work. This week we are returning to our traditional e-mail newsletter: a free twelve ounce cup of coffee so that you can sample one of our coffee varieties. Our number two coffee remains the Christmas Coffee for one final week–it’s a limited edition, so this is your last chance to buy some if it’s a new favorite of yours. We are featuring instead our Special Blend, our most popular coffee over the last thirty years of business. That’s quite a statement, considering how many coffees we’ve sold over the years! The longevity of this blend comes from how pleasing it is to most palates. We blend two light roasts and two dark roasts to make this cup: our French Roast, our Espresso Roast, our Sumatra Mandheling and our Colombian Supremo. Back when our deliveryman, Mike, worked for NID, he used to come in every morning for a mug of our Special Blend. Now that he works for us, he’s branched out, and he’s willing to try other coffees–but it’s a testimonial to how good this blend is that he drank it everyday for twenty years! To try your free cup, mention the code in red above (it’s “fancy Friday”). Come on in and sample our Special Blend today, or buy a pound for your New Year’s party! We’ve got it a dollar off per pound this week, to keep you awake next Monday night. Enjoy! How is your holiday season going? Are you ready for Christmas? I have a few stocking gifts left to collect (stockings are filled by Santa in our house, so shhhh! don’t tell the children), and most of my wrapping still to do, but otherwise I’m done. There’s one more Cornish Christmas tonight–we’re open until 9 pm, rain or shine–and tomorrow Caroline and I have a mother-daughter date at the Grass Valley Nutcracker. We’re progressing rapidly towards Christmas day, and the hastened tempo at the store is proof. We have a number of holiday traditions in our family, and their continuity helps to keep us on an even keel during this busy time. Each morning the kids hurry through their morning chores so that they can open their advent calendar (any impetus to get out of bed when you’re tired is appreciated in December!). Last night we read our new Christmas picture book, a collection that grows each year. The kids have an ornament collection too that slowly increases by one each year. We always have cioppino on Christmas Eve, and Jamaican Blue Mountain to start our Christmas morning. In our family we each take turns opening gifts while the others watch, one at a time. The list could continue: I love that every person and every family have their own conventions for their holidays. Ours have some variance each year, but the most important thing is that no matter what we are doing, we are doing it together. Despite the hustle and bustle of the last month, on Christmas Day we will gather with our family in a quiet celebration. That is my wish for all of you in the next week: may you find a moment or a morning of quiet in this Christmastime to appreciate the joys of the year. As 2012 rolls on to a close, we have one last deal for you. We’ve had a great year and in the spirit of paying it forward, we are offering two dollars off the pound of coffee of your choice. Use the code morning quiet to redeem your $2.00 off. We do appreciate all of our customers, and wish you each a Merry Christmas! What a whirlwind of a day! It’s been crazy around here, with Peppermint Mochas and gift baskets vying for attention. I’m taking a break now, sitting at my desk and typing this e-mail. I’ve got a cup of our seven bean soup (by the way, we are making soup now) and I’ve changed my shoes in preparation for Cornish Christmas tonight. It’s looking like Christmas in downtown Grass Valley! The staff and I were talking this morning (while toasting bagels and pulling shots of espresso) about how lucky we are to be so swamped. You are the reason we are in business. Thank you for trusting us to brew your coffee, wrap your gifts, and make your favorite espresso drink. We appreciate your patience when we’re busy, and your encouragement and smiles daily. We love when you compliment us, or take the time to check in and see how we’re doing on this side of the counter. If you are new to our weekly e-mails, we usually feature a coffee of the week, with a description of the bean and a coupon for a free cup. This week we’re doing something different. In appreciation for each of you who receive this e-mail, and all the customers who stride through our doors daily, we’ve decided to give away two of our gift baskets, two of our logo t-shirts, and two of our new logo mugs. There’s so many of you, that it doesn’t make sense to give away only one item. This way there will be lots of opportunities to win! We will draw a winner every day next week (it’s the season of giving! ), and two next Friday. You can join in our giveaway by printing the form below and bringing it to our store, or by sending us an e-mail with your name and contact information. Everyone we hear from will be entered. If you don’t live in this area, we’ll ship anywhere within the United States, so please respond anyway. We want to thank you whether you come in everyday, buy beans weekly at SPD, or have us ship you coffee once a year. If you’re a fan of Carolines Coffee Roasters, but you’ve moved away, we appreciate that you keep in contact with us. From the Carolines family to your family, Merry Christmas! Print out this entry form and drop it off at our downtown location anytime before next Friday the 21st. The sooner you enter, the more chances you will have to win! Limit one entry per customer please. Thank you. How is your December going? Today is a day of remembrance for those who died 71 years ago at Pearl Harbor. I’ve been to the USS Arizona memorial twice, and it is a somber experience, invoking the memory of all those who have given their lives for our country. I have been blessed in my lifetime to know a number of World War II veterans, most notably my Grandpa who was a parachuting medic on the Western front. I am taking a moment today to remember him, and all veterans. In a busy season, it’s good to remember that life is precious, and so are our national freedoms. It was red fedora day around here on Wednesday–thanks to a customer who gifted the hats! This week I’ve been trying to slow down and appreciate my surroundings, and especially my family and friends. Last week felt rushed and stressful to me (maybe the stormy weather was partly to blame?). If you have kids, you have probably noticed that they quickly pick up on parental stress. We’ve all had a better week since I’ve taken the time to slow down my responses and remember what is truly important. One of the pleasures I’ve enjoyed this week is my morning cup of coffee. The scene out the window most of the week was rather colorless, with fog drifting by or rain pounding down. It had a quiet, stark beauty as the tree trunks appeared in sharp contrast to the soft edges of the dripping sky. This morning pigment reappeared in my view, a brushstroke of pink across the window heralding the return of the sun. It’s nice to see the sun again. I don’t drink much dark roast coffee (unless I’m in San Francisco, and I can’t find anything else–see this blogpost), so those of you who prefer a dark roast don’t often get a chance for a free cup. Well this is your chance this holiday season to try a cup for free. Our featured coffee this week is our Fair Trade Organic Dark French Italian Roast. Try saying that five times fast! Around here we shorten it to Fair Trade Italian. This is the darkest coffee that we keep brewed, and it is a blend of Guatemalan, Peruvian and Brazilian–all Fair Trade. We blend these for a balanced dark roast. If it seems like you hear the word “balanced” frequently in reference to our blends, that’s because it is our goal when blending. When you take coffee beans this dark, you no longer taste the nuances of the origin, but instead the darkness of the bean. A lot of you love coffee like this (maybe particularly if you are from San Francisco!). You can use the code in red above (it’s dripping sky) to try a free twelve ounce cup of our Fair Trade Organic Dark French Italian Roast. If you’re not a fan of dark roast coffees, you are welcome to switch it out for our Christmas Coffee–I’ve certainly been enjoying it these holidays. Whatever you prefer, raise your cup today in honor of those who have fought for our country. Cheers! Good morning! I’m writing this e-mail early today as I attempt to leave the store by noon so that I can head out of town for a Bruce Springsteen concert. It is an incredibly tumultuous day outside: a warm, windy and wet storm that kept me awake a lot of the night. I was peaceful and cozy snuggled under my down comforter listening to the conversation out the window. There were whistles and thumps as the raindrops swirled in the wind like a dizzy child stumbling off a merry-go-round. I love waking to those sounds. The best part about a grey winter’s day is waking up to a cup of hot coffee. Today we have a few coffee-related treats for you. First of all, we’re giving away one of the mugs in the header picture (or maybe more than one–I haven’t decided). Head on over to our blog, here, and leave a comment for your chance to win. We’ll let the random number generator choose the winner on Monday, so check back to see if it’s you. Next we have our annual holiday offer for fresh-roasted Jamaican Blue Mountain. Jamaican is our most expensive varietal. It is absolutely an amazing coffee, and the care that goes into processing these beans makes it a special treat. This coffee comes in on an airplane, instead of the usual sea freight travel that most beans go through. You can find more information about how the coffee cherries are harvested and processed on the RSW Estate website here. Seldom do you find a coffee that is both grown and processed in the same place. This allows for extreme care and control to be taken with these beans. The process is well-described in this article from our coffee broker, Knutsen Coffees. On our end, we receive these beans in a wooden barrel, not a burlap sack. We roast the beans to a city plus, just after the first crack. This allows you to taste all the characteristics of the bean in the cup. It is a remarkable cup of coffee. When we roasted the Jamaican earlier this week, we did a French Press for all of our morning staff to sample: yum! It’s a very smooth coffee, balanced, so that no one note sounds louder than the others. It has sweet floral tones and a long finish, so that the flavor lingers as you sip. At our home, we have a Christmas Day tradition of drinking Jamaican Blue Mountain. A few years ago we were thinking of how we could pass this lovely tradition on to you, and we came up with this offer: we will roast Jamaican to order on December 14th (to include those of you who need it shipped), and you can pick it up after 10 am that day. If you sign up in advance, you will receive a discounted price of $45 per pound. To sign up, e-mail us at sales@carolinescoffee.com with “Jamaican” in the subject line. Please give us your contact information, and let us know if the order is for pick-up or delivery (regular UPS shipping rates will apply), the quantity you would like, and whether you would like it to be whole bean or ground. If you do want it ground, specify the grind you need. You can also sign up in our store, or by leaving a comment below with the same information. This week our special is a dollar off the espresso drink of your choice. You can use the code in red above (it’s wooden barrel), to receive your discount. Once per customer please. Best wishes to all of you on this stormy day: may you travel safely wherever you are headed, and enjoy good coffee when you arrive! Don’t you think a new mug would be lovely? How about for free? We received three new styles of mugs yesterday, so I’m thinking it’s time for a giveaway. 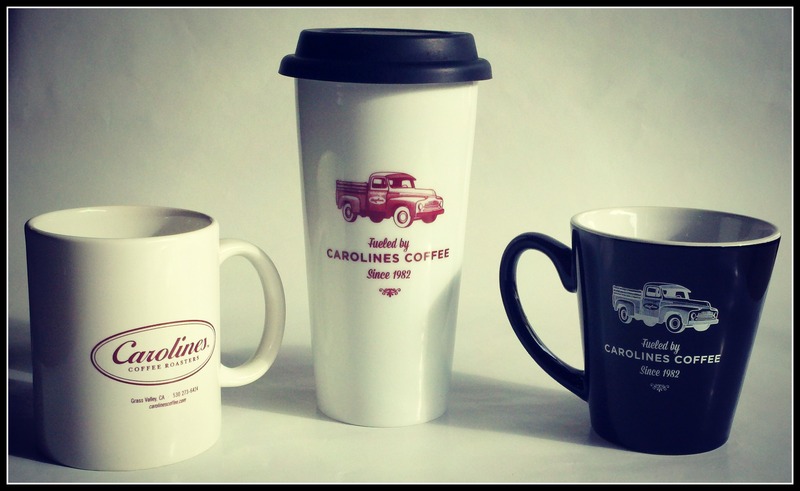 Leave a comment on this blog post to win a Carolines Coffee Roasters mug (you can choose between the three pictured below if you are the winner). We’re passing on the joy of the season! It’s time for a mug giveaway! 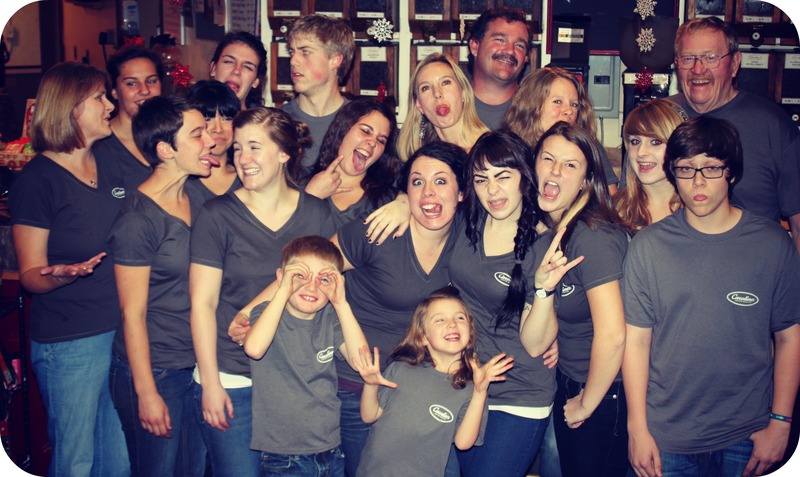 family is a thriving small business in a beautiful small town–a good attitude to focus on in the rush of this season. From Thanksgiving to Christmas we have the challenge in our family of finding the balance between the joy and peace of the season and the busyness of being in retail. Trace and I are at Carolines longer hours: there’s more coffee to roast, more customers to help, and even more bills to pay. Fortunately we both love the social interaction, even when front counter turns into a zoo. It’s fun to see all of you, and to meet new customers. The other day (what are the odds? ), we had three different roasters in the store within eight hours. Your stories are interesting, as are your questions, whether you come from another country or down the street. We are open until 9 pm tonight for the first Cornish Christmas. If you’ve never been to this downtown event, it has been a tradition in Grass Valley for 45 years, with local artisans selling their wares on the streets while musicians young and old keep the atmosphere cheerful. There are hot roasted chestnuts, the stores are open late, and there’s even a Santa’s Workshop for the young ones. My kids came with me to work today, and they’ve been asking all day if we can go to Cornish Christmas yet. Did I mention there is a kettle corn vendor? That might be the most popular booth among the youth in my family. “We watch and taste all year for unique and great coffees to incorporate into our Christmas blend. We look for beans that complement each other in special ways. Blends might not be in vogue right now with the glitterati of the coffee world, but we love them regardless. It’s so much fun to taste and blend and blend and taste to find the perfect balance. You can see both labels in detail on our blog here. You can have a twelve ounce cup of our Christmas Coffee free of charge by mentioning the code in red above (it’s roasted chestnuts). If you’re visiting from out of town, welcome! To all of you, may you find joy in this busy season and a moment to enjoy a cup of good coffee. Price: $12.99 / 12 oz. 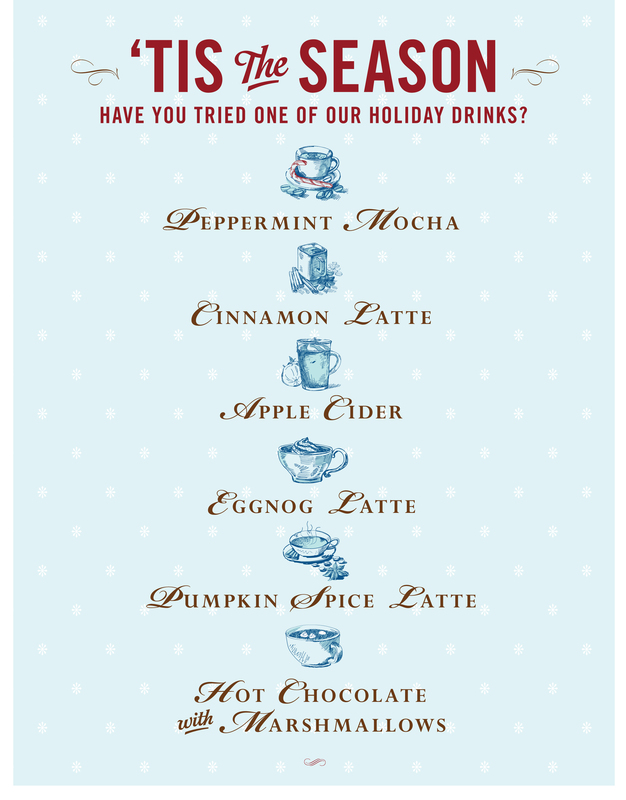 Our Holiday Drinks have arrived! We might have had too much fun at our staff meeting last night, as the picture above can attest. Anytime I used to go somewhere as a child, my mom would say: “don’t have too much fun.” My whole life I’ve had trouble abiding by that statement (which she meant purely in jest), and I think that our employees do too. Our goal this holiday season is to pass that spirit on to our customers: we want to bring joy to your holidays. In the middle of your shopping spree, I hope you can stop in and be greeted with a smile, no matter how busy we are. 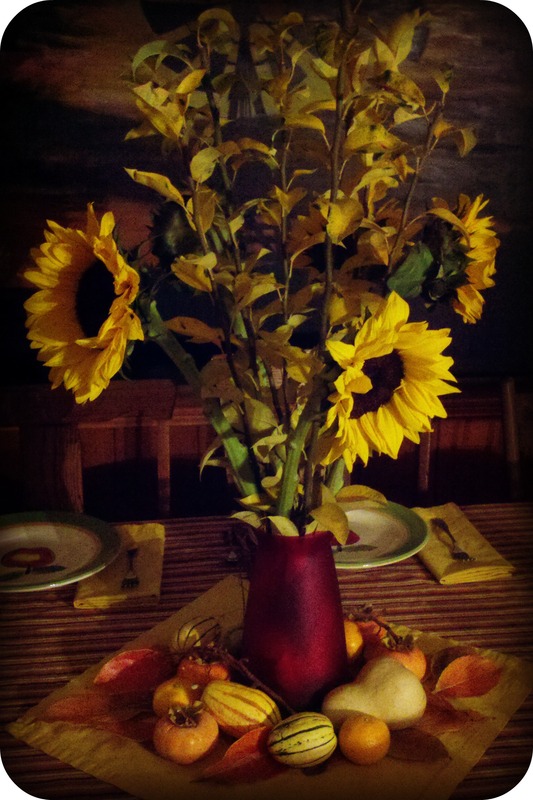 Next week is Thanksgiving, one of the holidays that I truly love. Gratitude is a great reason to gather together, and no matter what your circumstances, it good to find thankfulness in your daily life. Today I’m thankful for all of you, the customers who keep us in business, and who often bring a smile to our faces by your presence in our store. A list of all the things and non-things and people for which I am grateful would be unending, so I won’t share them all. A few items of business before we move on to the coffee of the week. Yes, for those of you who have asked, we do have Jamaican Blue Mountain in again. 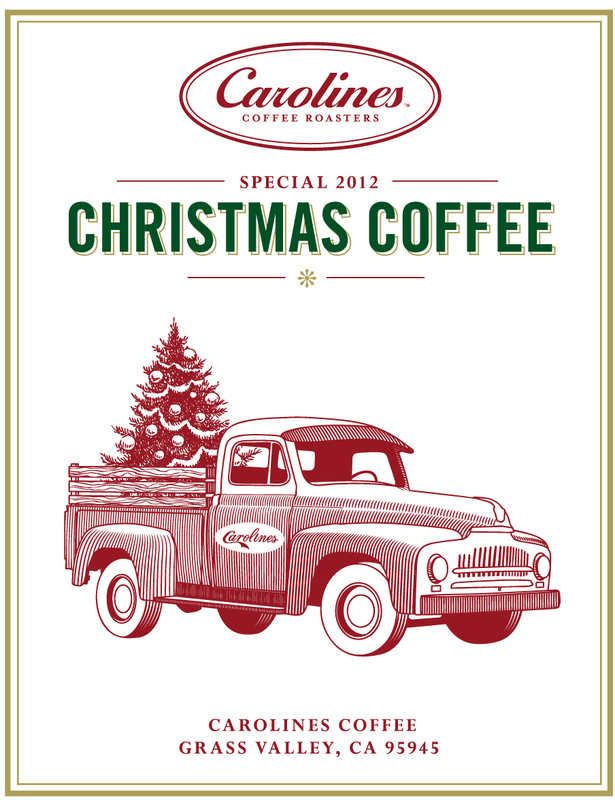 We will also have our annual, limited edition Christmas Coffee available starting Monday. I’ll tell you more about it next week, but if you need some for Thanksgiving guests, this year we’ve got you covered. I’ve also got a chance for you to win an eggnog latte! Erin over at the Outside Inn has done a blog post about our neighbor, Booktown Books, and if you click here, you can read about their business and leave a comment for a free drink from us. 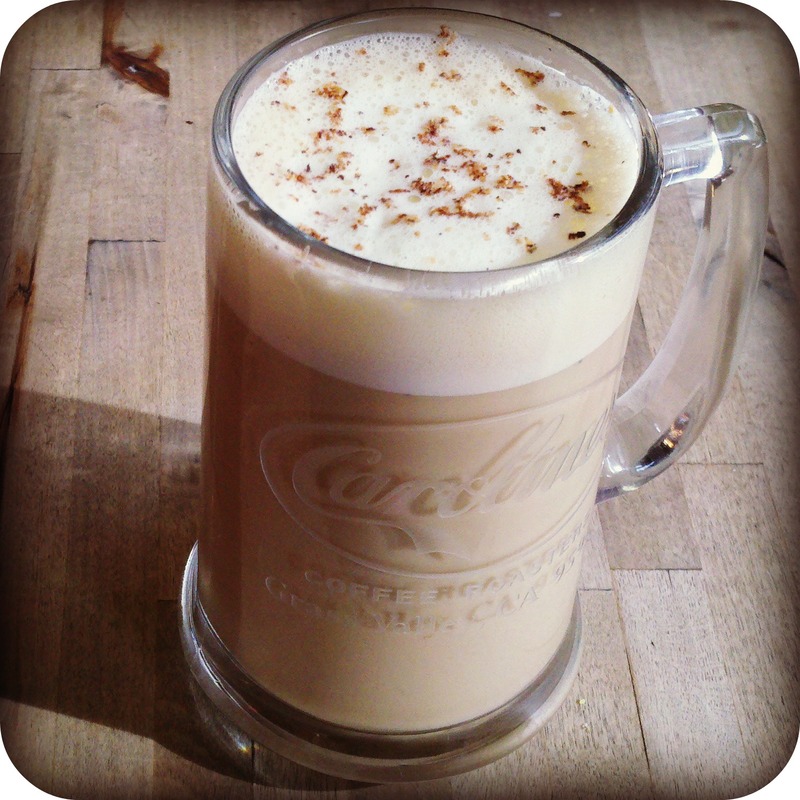 Win a free Eggnog Latte on the Outside Inn blog! Today’s coffee is an old favorite, that we probably haven’t carried for ten years (and I’m no good with dates, so it could be longer). This is an Aged Sumatra Mandheling, from Pawani, and aged in this case does not mean leftover. These beans are from the 2008 crop, and they have been stored with great care, alternating between being in a shed and being spread on patios to absorb moisture. This replicates what used to occur when the coffee was transported in sailing ships and the sea breeze had plenty of time to work on the beans. This coffee is full of flavor, and the taste lingers on your palate. It has a bold flavor and complex savory notes when you drink it. Aged Sumatra is unusual, and we don’t often have it offered anymore, so come try a cup while we have it brewed. You are welcome to mention the code highlighted in red above (in honor of Thanksgiving, it’s gratitude daily) to receive a free twelve ounce cup. I hope each one of you takes a moment on Thanksgiving to appreciate your life. If you’re looking for a worthy family activity, we love to attend the MEB2 Turkey Trot together in the morning. Also, before I end this missive, let me remind you that next Friday will be the first Cornish Christmas. We will once again be open until 9 pm every Friday from Thanksgiving to Christmas. It’s a festive event, and we’ll be making loads of eggnog lattes and peppermint mochas to warm your hands as you enjoy the scene up the street. Santa’s Workshop will be there again, offering free gift wrapping and free crafts for the kids, as well as the opportunity to meet Santa. This year he will be appearing at 145 Mill Street: check the GVDA website here for more details. May all of your holiday season be full of joy and gratitude!